We introduce you to some new Sumatran tiger cubs this issue along with a host of more regular felines. that would make more suitable companions at home. The Tonkinese are little terrors, but delightful. Check them out. There's also a free pattern to knit a catnip mouse your cat will love. 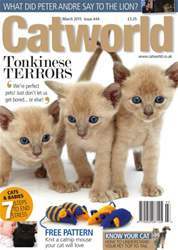 Our experts show you how to understand your cat from top to tail, and also advise on coping with a baby in the house.